I don’t know if you noticed, but Zombies have made a big come back. Thanks to the AMC show, the Walking Dead, and fun games like Plants Versus Zombies, this is the year of the Zombie. 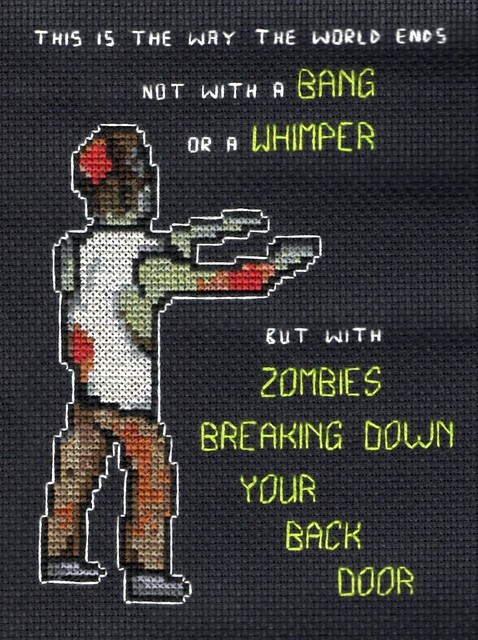 What better way to show your love than a Zombie cross stitch project found here at Feeling Stitchy. I wonder if OoTDad would love to find this in his Christmas stocking. Rudolph Day is coming up! Time to start getting those crafty projects going! I was never into the whole Zombie thing but for some reason the show, The Walking Dead, has really lured me in. It is the perfect show to watch with your hubby, it is like a Zombie Soap Opera. I don’t know how to cross stitch but this has me thinking maybe I should learn. I wasn’t into it either until The Walking Dead, but Hubs likes it, and it has enough drama to keep me happy. I like that I don’t have to see the zombies that often too, if it was all gore, all the time, I couldn’t watch it!